Why did no one tell us about this screamo cover of "Who Let The Dogs Out"? Baha Men’s “Who Let The Dogs Out?,” the 2000 hit that asked an innocent nation who let the dogs out, is a deeply funny song. The whiplash between its repetitive, barking chorus and verses full of canned record scratches, tinny, piano-led melodies, and lyrics like “a doggy is nothing if he don’t hold a bone,” is bewildering, captivating, and, most of all, hilarious. Now, nearly 20 years later, with nobody any closer to knowing who let the dogs out, a screamo-lite band called Our Last Night has teamed up with the Baha Men to pose the question once more. 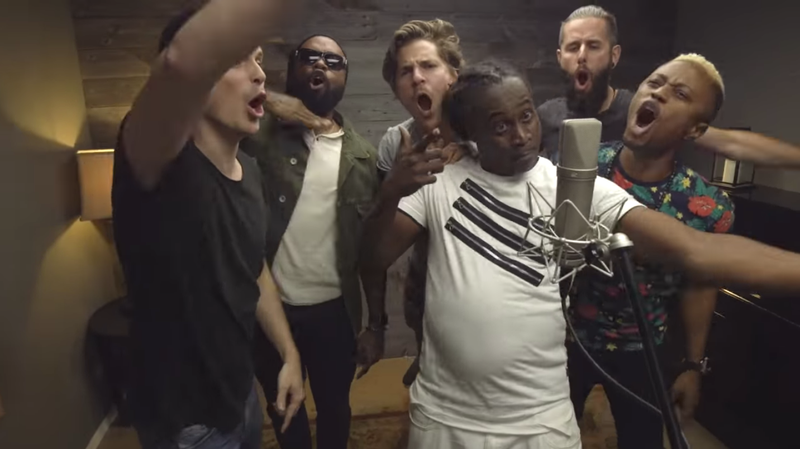 The video opens with a singer from Our Last Night telling the viewer “we just redid one of our favorite songs.” One of the Baha Men says, “Killed it!” and everyone chimes in with descriptions of how good the song turned out. “It’s sick.” “Craaaazy.” “It was soooo lit.” “It’s so new and so fresh.” Expectations set, the song begins with a familiar query, yelled in the same timbre as we’ve come to expect. The woofing response is coupled with a hyper-clean blast of drums, bass, and guitar and then, unfortunately, we’re off to the races. The new, punched up version of “Who Let The Dogs Out” raises many, many questions. What unholy arrangement brought us to the point where this new version was not only thought of, but written, rehearsed, and recorded? Who spent the hours mixing and mastering the song without turning into a dead-eyed, slobbering husk of a human in the process? As always, though, what we’re left wondering most is the same as it ever was: who did let those dogs out? Fortunately, in this calendar year, we’re set to receive some long-awaited answers in the form of a documentary all about the Baha Men’s chart-topping riddle. God help us all if the film inspires even more covers in the years to come. A new documentary hopes to answer history&apos;s catchiest question: Who let the dogs out?